December is upon us, and our hard-water ice fishing season is still seemingly a far way off for many bodies of water. With a much milder El Nino winter, it seems that there is still be much more open-water fishing to be had here in northern Michigan. Rivers will stay open, unlike the past two winters, and big bodies of water like Grand Traverse Bays will almost assuredly remain open as well. Grand Traverse Bays in early winter can be an awesome place to wet a line when the weather cooperates. Lake trout season is still closed out on the Bays, but there is still some great yellow perch action to be had, and whitefish will be moving shallow as well. For perch anglers, Deep Water Point on East Bay is always a go-to spot. Wigglers or minnows are the top choices out here on the Bays, but sometimes a jigging spoon can really help to attract fish that are spread out. Personally, I like a jigging spoon with a dropper chain tipped with a couple of wigglers or a small piece of minnow to call in fussy fish. Very often it’s a small jigging cadence that gets fish to move in closer, and then a dead-stick approach to tempt bites. Many perch anglers opt to use their ice fishing electronics for this style of fishing because it is immediate feedback on how a fish is reacting to our offerings. And don’t be surprised when a big Grand Traverse Bay whitefish or lake trout gobbles up your perch rig. Whitefish love a vertically jigged Swedish pimple or a small Jonah Jig. Wigglers work well at times, also, but whitefish can be so tricky in hooking when using wigglers, that sometimes it’s better to look for other techniques. 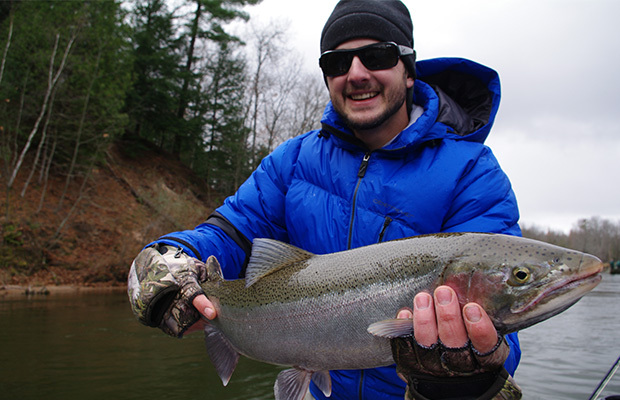 Steelhead on the rivers are still a great option in December, before the dead of winter truly sets in. Last year, winter hit us in November and didn’t let up. This year, water should be flowing well throughout the winter if we do indeed have the El Nino year that is predicted. Spawn bags can work wonders on Lake Michigan tributary steelhead, but don’t forget about small jigs tipped with wax worms. The old Jig and wax routine can be truly deadly on winter steelhead when fished under a float. And if there are trout in the system? They love a good wax worm too! Inland lakes probably won’t see too much ice in December, with the exception of the smaller lakes in the middle of the state. Lakes closer to Lake Michigan will be protected by the big lake, tempering air temperatures. This means that anglers can still get out in a boat on many bodies of water. Yellow perch are the target of choice for many anglers, and the techniques that work on the Bays work well here too. The flash of a minnow can really trigger aggressive feeding responses from big perch this time of year, and with fishing pressure low, these fish are often very willing to bite.